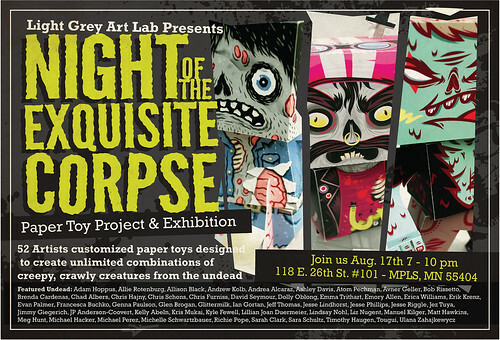 The team at Light Grey Art Lab is busy setting up for our newest show, Night of the Exquisite Corpse, a group show of papercraft zombies featuring 52 amazing artists! The Night of the Exquisite Corpse opening reception is this Friday, August 17th, from 7–10 p.m! 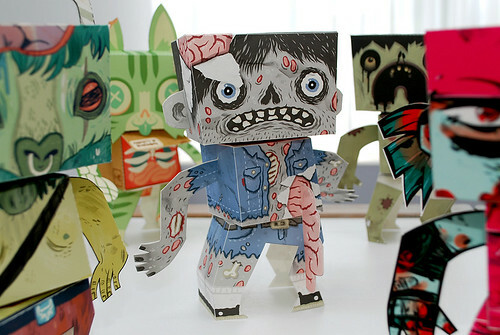 Stop by Light Grey Art Lab to see a horde of mini-zombie papercraft toys! We'll also have refreshments, free DIY zombie templates, and an interactive display letting you swap the head, torso and legs of the zombies to make some truly bizarre combinations of creatures! We're super excited for the opening of this show so stop by to see the zombies and say hi! You can RSVP and invite friends via our Facebook events page! Remember, the opening reception is Friday, August 17th from 7- 10pm! We're located on the corner of Stevens Ave and 26th Street - right across from the Minneapolis College of Art & Design. Street parking is available on Stevens, 26th and 1st Ave.